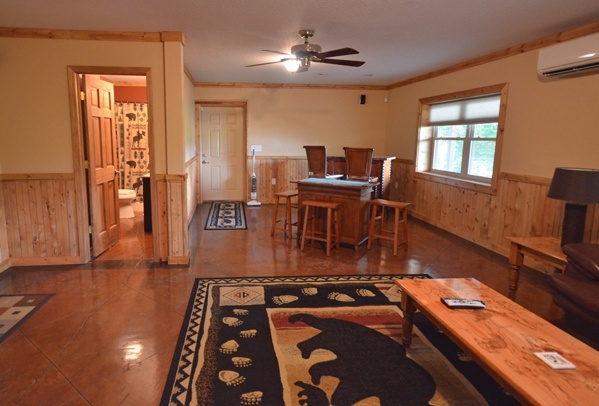 Video to the Max: There is a TV in each of the three bedrooms. 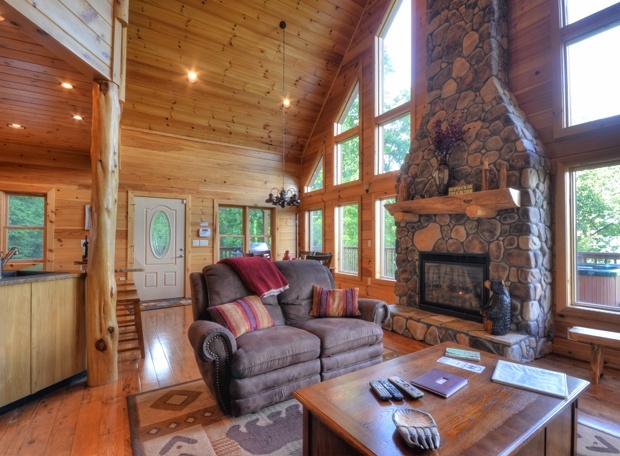 Plus the Living Room and Media Room each have a TV, so with a total of five TVs, everyone can watch what they want. 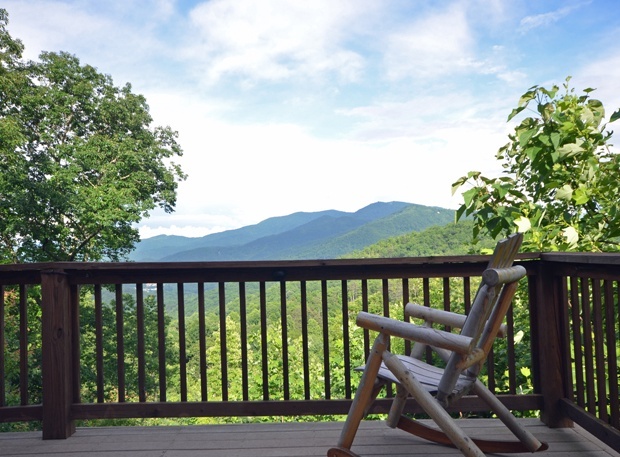 Mountain views will greet you as soon as you arrive at this secluded cabin. 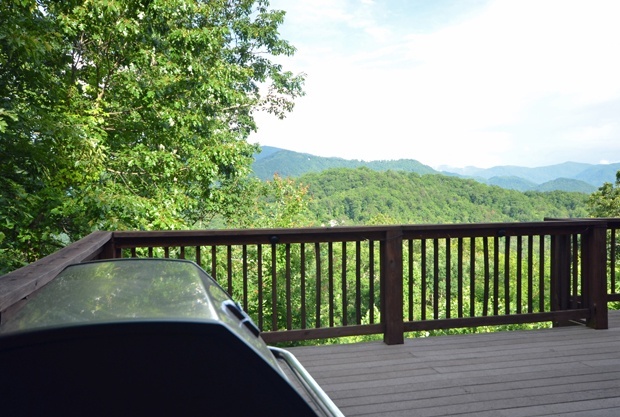 There’s plenty of room to enjoy the great outdoors in comfort. 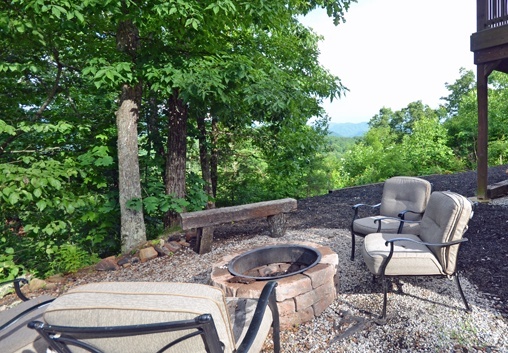 You can relax in cozy chairs around the raised Fire Pit and while grilling marshmallows or hot dogs the smoky aroma will add to the view of the Great Smoky Mountains before you. Any time of the day you’ll see ever changing skies above you shifting from sunrise, to lazy clouds, to sunset and then glimmering stars. 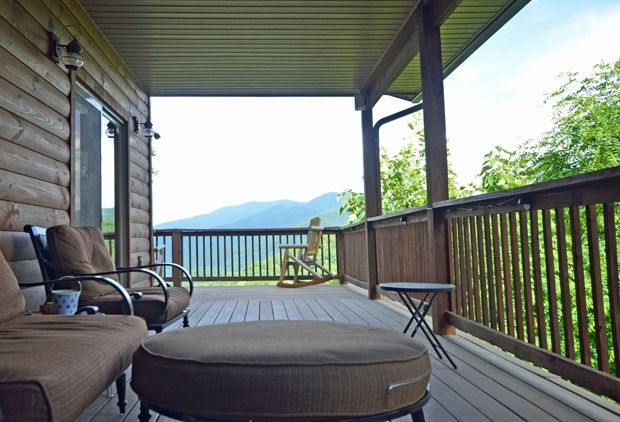 Enjoy Sunshine on the deck in the wooden chaise lounges or relax in the shade in the comfy furniture on the side porch. 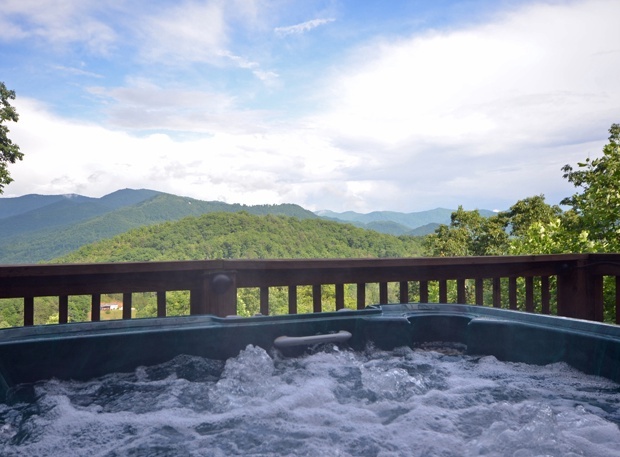 Listen to music while you relax in the bubbling hot tub and enjoy your favorite tunes from the outdoor sound system. 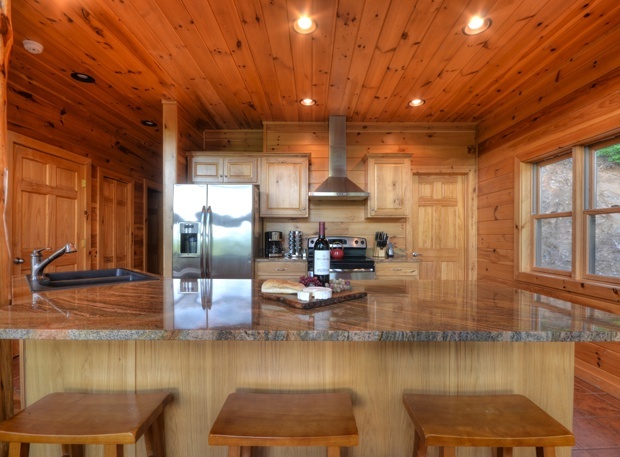 Shimmering granite counters and glowing wood cabinets are offset by stainless steel appliances in this gourmet kitchen. 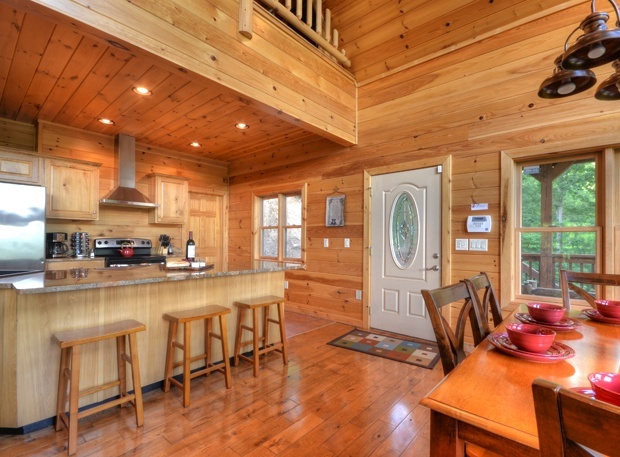 The gleaming kitchen is well equipped for making your favorite meals. 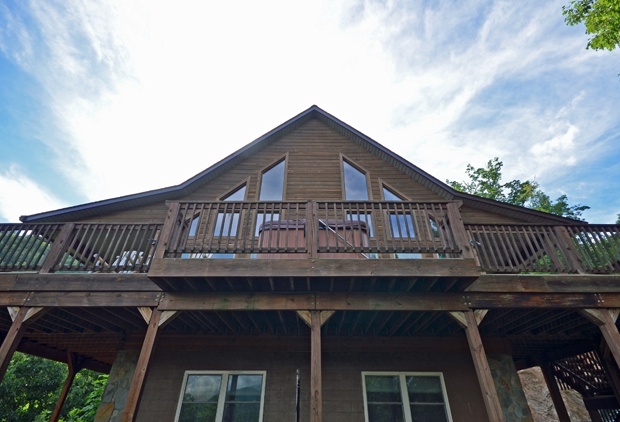 There’s room for your entire party with the dining table seating six and the breakfast bar seating three. 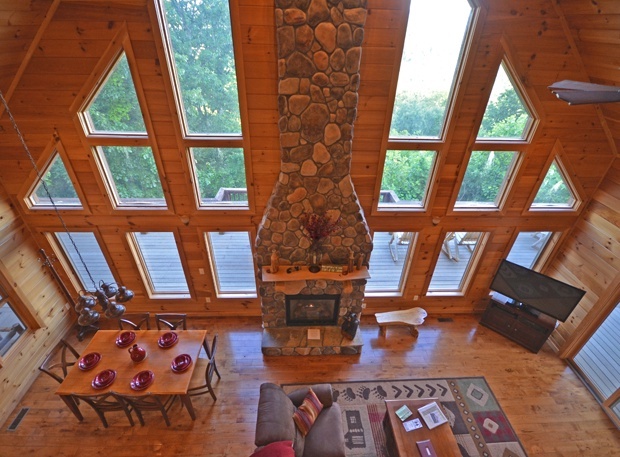 The open floor plan and huge windows of the main level lets the mountain views wash over the living room, the dining area and kitchen. 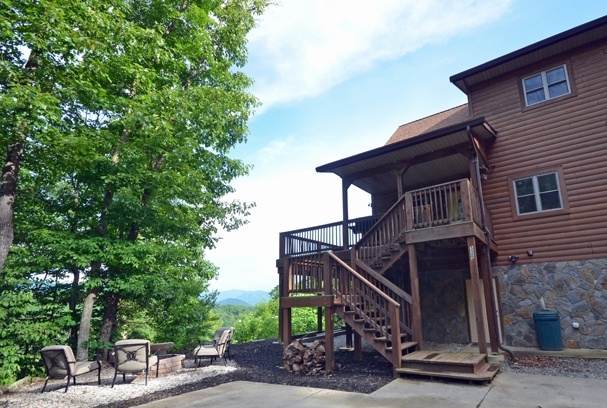 Unwind in the living room on opulent leather furniture and savor the mountain views, the dancing flames of the gas fireplace, and enjoy your favorite movies on the large satellite flat screen TV. 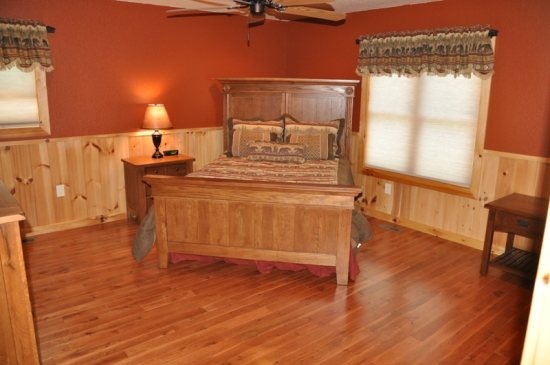 Roomy and gracefully appointed, the main floor Master Bedroom has a King-size bed and private bath. 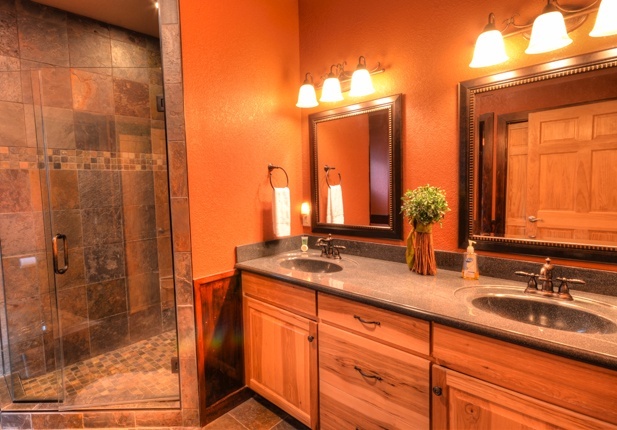 The master bath has double sinks with gorgeous tile work and a slate shower stall with 6 refreshing shower heads. 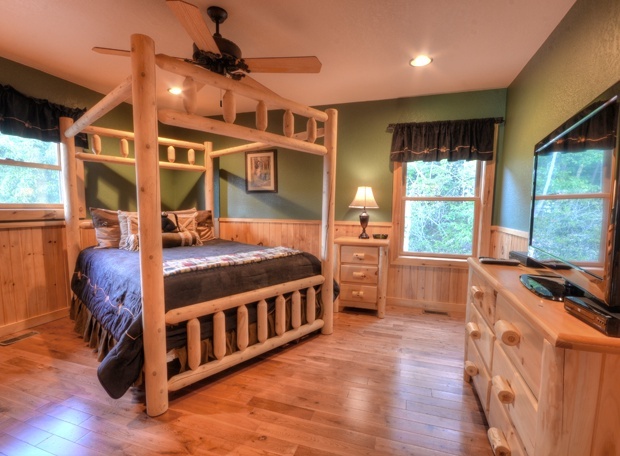 Thoughtful touches make this bedroom sublimely romantic. 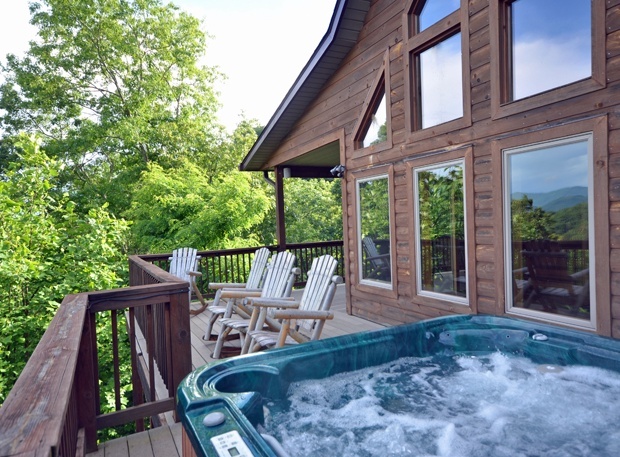 There’s also a flat screen TV, stone gas fireplace, curtains for all the windows, deck access to the porch and comfy furniture on the same level as the hot tub. 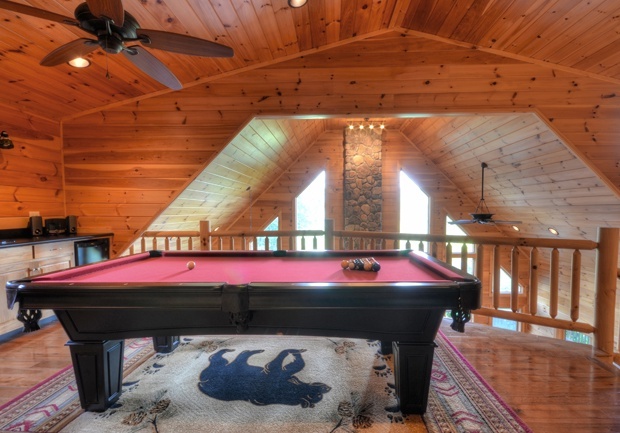 Gleaming wood, high ceilings, a wet bar, and bistro tables make the loft game room the perfect spot to enjoy your own pool tournament. 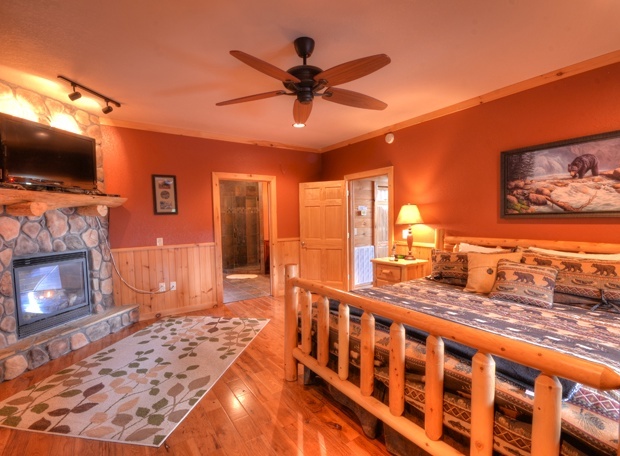 The upstairs also has two private bedrooms each with their own queen bed and their own TV. 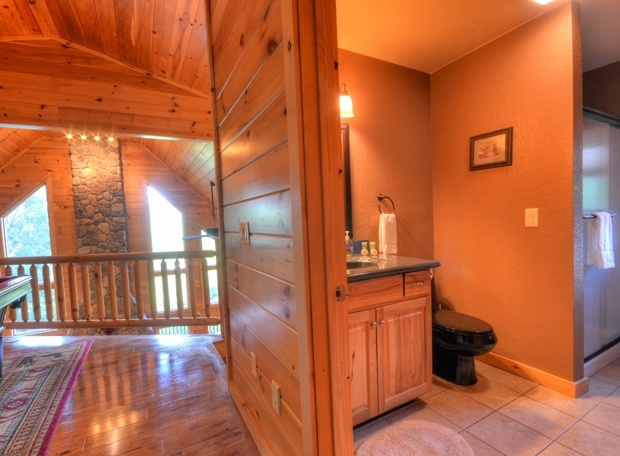 The second full bath with a shower stall is also in the upstairs. 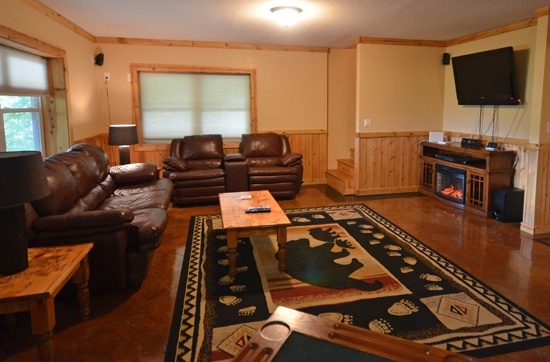 The downstairs media room is a real treat with the electric fireplace, yet another flat-panel Satellite TV, a Nintendo Wii, and more leather furniture to kick back on. 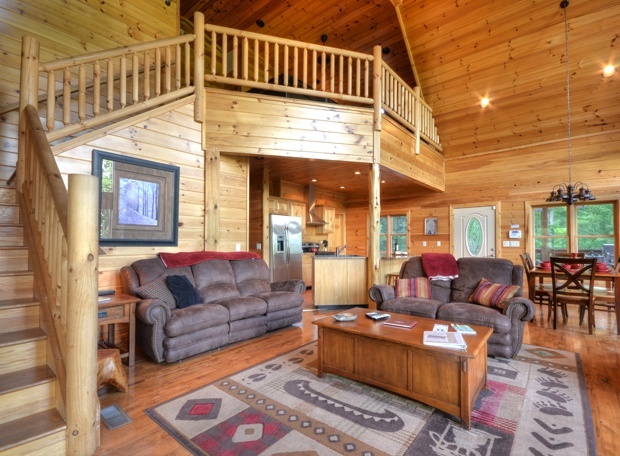 The sofa is also a sleeper and there is an adjacent full bath, so up to 8 people can enjoy your mountain vacation here. At Southern Comfort, you won’t have to go to the Harrah’s Casino for fun. There’s also a dry bar in the theater room and a table for black jack and craps.